If only people would stop chasing after gods. If only people would fall into the hands of God Almighty. If only people would trust Jesus as Lord and Savior. If only people would see themselves for who they really are. If only people would stop placing themselves before others. If only people would worship the One true God. If only people would make Jesus the priority. If only people would bask in the Word of God. If only people would seek the Holy Spirit for guidance. If only people would fear the Lord and serve him. If only people would obey the Lord and not rebel. If only our leaders would seek wisdom that only comes from the Lord. Who doesn’t like a good one-liner? I, for one, have never been very good at coming up with one-liners on the spot and therefore I have much respect for those who have a quick wit. Most of my “on-the-spot” one-liners are thought of moments after the moment has past and thus my one-liner because irrelevant. One-liners can be funny or destructive. They can draw people in. One-liners can emphasize a point, but whatever the case, they are not meant to be deep and necessarily thought provoking but rather meant to pacify a moment and then move on. That may serve a purpose for a short time but if you want something deeper you need a longer conversation with that person. You need more than just one line. Never read just one verse in the Bible. Read a bunch of them. Read a paragraph; a chapter or more. The idea of that post is to communicate that by reading only one verse you can lose important context. And as many of you know, you can take nearly any Bible verse and twist it to mean something completely different if you pull it out of it’s original context. Therefore you need more information. I am doing something a little different now on social media. I am not ceasing my one-liners but rather giving one-liners based on my reading of a whole chapter of the Bible and then directing people to that chapter to “verify” and/or read the context themselves. For me personally, this has proven to be a great spiritual discipline as I reflect on a chapter and then formulate a summary in my head to share. Instead of a scripture one-liner I am sharing a chapter one-liner. My attempt is to be more biblical faithful. Sure, there may be certain verses that speak to you and ones that are worthy for further reflection, but do so in context. Reflect on your verse but read the paragraph and/or the chapter that contains that verse to make sure you don’t miss the intended meaning. Get the context and by do so, you will be more faithful to scripture and more faithful about your spiritual growth. One-liners can be good and grab attention, but make sure your focusing attention on the right things. 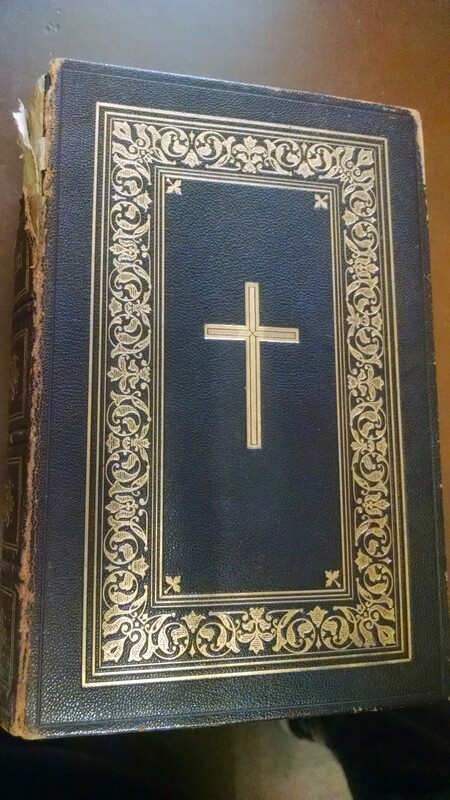 This is an old German Bible, from 1905, that has been in my office for a long time. 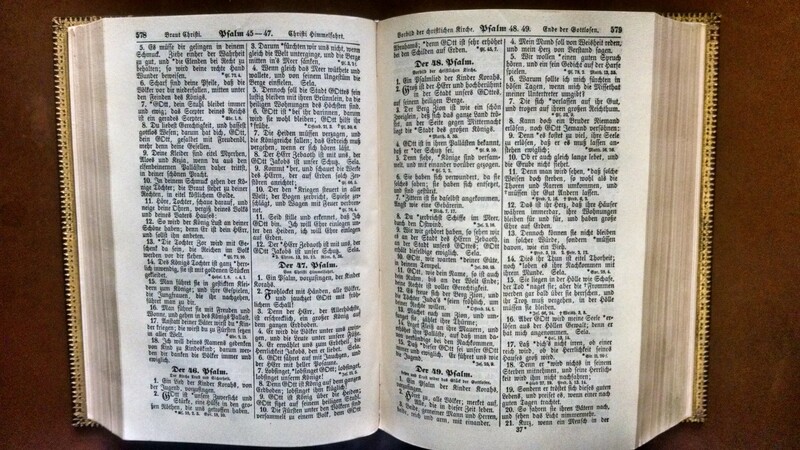 The reason I have this Bible close by, on my desk, is to serve as a reminder of Salem’s past (an old German congregation) but also of a past that seems to be dwindling away. I look at this Bible and I think about those people 110 years ago reading this and I wonder if they ever imagined a day when the Bible would not be the sole authoritative source and norm for faith and life for many people. I wonder if they ever imagined a day when the Bible would be picked apart for “errors” in order to support a certain belief or way of life. I wonder if people 110 years ago imagined a day when the Bible would become just another authoritative source among many others. I wonder if they ever imagined a day when experience or cultural majority or feelings would trump the Word of God. And it saddens me to think about such things. How have we gotten to such a point? I know Bible scholars and theologians can answer that question better than me but no matter what is said, it’s not going to help. I believe the Bible to be THE inspired Word of God; inerrant and authoritative. It is THE sole authority for me. If any outside “authority” conflicts with the Bible then the Bible wins out. Holy Scripture is not to be tampered with. Sure, there are parts that I don’t like or understand but it is the Word of God and I except them. I understand that fallible human beings copied manuscripts over and over and over again but since this is THE inspired Word of God, I believe God would have never allowed errors to be repeated over time that would lead people away from the Truth. Now some may call me naive to hold such a view but that’s fine; I can handle that. For me, the Word of God tells me what I need to know for salvation and to bring glory to God; everything else flows from that authority. Those words are God’s words. If that doesn’t give you goose bumps go back and read that list again and this time pay attention. Holy Scripture contains the very words of God and they are given to you and to me. No other authority can trump it. As Christians we need to cling to the Word of God tighter than ever before and not allow anyone to demean it’s authority. We need to read and study this Word and then read and study it some more. We need to pray and then listen to this Word; and then pray some more and listen again. We need to confess our shortcomings (and God knows I am far from perfect) and seek the Good News of Jesus Christ. Don’t get me wrong, I am not suggesting that you worship a book but rather worship the One whose words are contained in this book; listening and obeying. The Bible is THE Word of God. Period. I know I fall short in so many ways; I’m a sinner after all. I know I don’t always treat the Bible the way I should. I know I don’t always appeal to it’s authority as I should. But I ask God to grant me the faith to trust His holy Word as THE Word of Life. So let’s not mess with it but rather read and listen to it and live by it’s words. God’s Word is life and salvation, so commit yourself to the reading of it (private and public) and take it’s words seriously. Holy Father, it awes me to think that You have given us Your holy Word in such a way. May we never take these words of life for granted but rather let us be shaped by them. May the Bible hold authority for Your people in this dark and evil world. 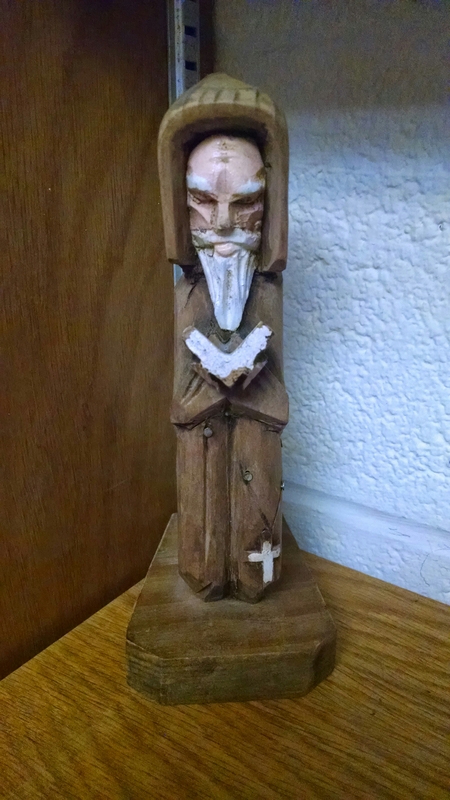 Holy Father, speak to me that I may speak. In Jesus name I pray, Amen. That is my bookshelf in my tiny church office. This used to be a badge of honor; all those books up there (many of which I haven’t read), but today I hardly notice them. It’s a rare moment that I even look at this with the intention of looking for particular book. Nowadays, I either consult my Kindle library or search Google. Part of me wonders why I even keep these books anymore. When I attend conferences I will still browse the bookstore but rarely will I buy anything. If I find a book I like I search for the Kindle version on Amazon and then add it to my wishlist to buy later. If there is no Kindle version then I am force to discern how bad I really want/need the book. I remember not so long ago going to these conferences and coming home with tons of books, but no more. And then there’s my Bible. For the most part, I am reading my Bible through my YouVersion Bible app on my phone or my tablet. 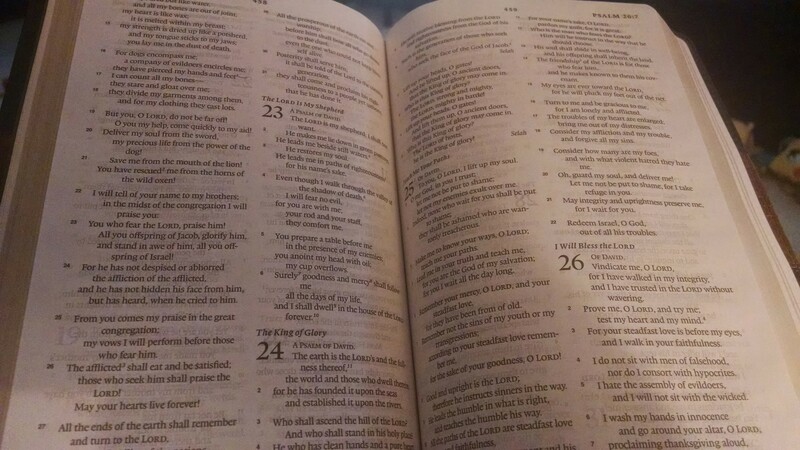 I do use my paper Bible in worship and in Bible study, but generally I go to the electronic version for my Bible reading, but sometimes I just need to hold a paper Bible and read. It’s not that it’s more holy or anything but in a weird sort of way I feel closer to the Word when I can actually touch the paper. And so I keep a paper Bible always close at hand. I am actually trying to recondition myself to use it more often and only use my Bible app if I absolutely need to or if I want to quickly share something on social media. and feeling a little “old fashioned” (but that’s OK). Technology can greatly improve many things but it can never replace the paper Bible. I’m OK with ebooks and downsizing my former badge of honor in my tiny church office but I hope our world never gets to the point where paper Bibles are obsolete; found only in museums under glass. I guarantee that you have nothing in your wardrobe that comes close to this. Nothing that can clothe you to face the Devil’s schemes. Nothing that can prepare you for battle like what God gives you through faith in Jesus. So suit up with what God gives and be strong in the strength that only God gives. And then, according to the author of Ephesians, pray and keep alert. Don’t become complacent. And also make supplications for all the Saints as we fight the fight of faith; as we do battle in this fallen world. There is much persecution going on in the world for Christians and it is only going to get worse. 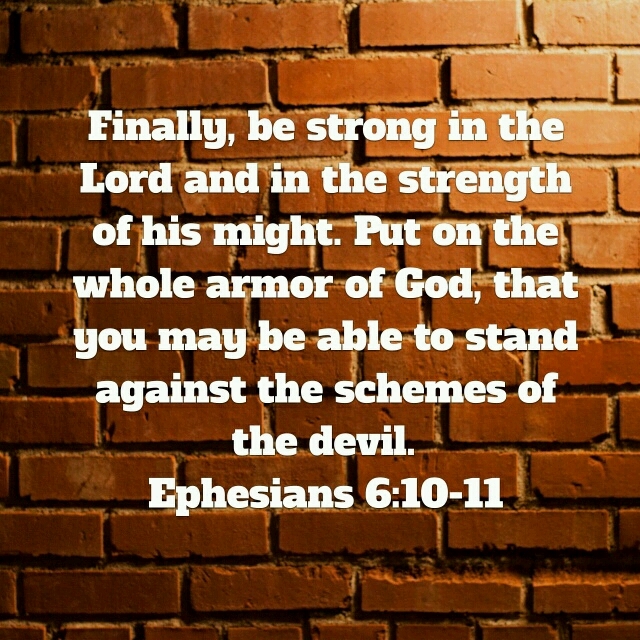 But if you have suited up in the armor of God, there is nothing to worry about. And praise be to God for that. Mighty God, may we stand strong in your strength and may the strength we show bring You glory. Amen. It has been a John 14 kind of day as this chapter has been stuck (in a good way) in my brain and heart. ~ Obedience is a joy because of the one you are obeying. ~ Obedience is trusting the person you are obeying. ~ Obedience is not something to avoid consequences. ~ Obedience comes naturally because of the one whom you love. ~ Obedience out of love is not demanded but freely given. ~ Obedience out of duty is not love. ~ Obedience out of love is not about you but rather the one whom you love. This is really a beautiful verse in the midst of a beautiful chapter. 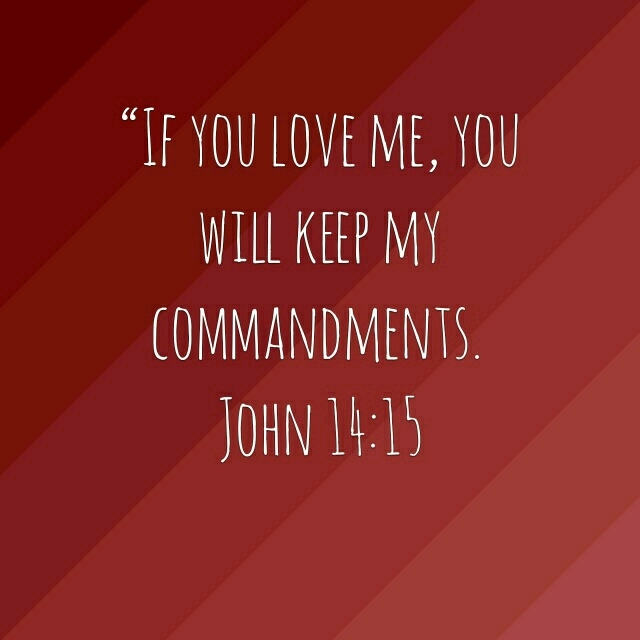 The love of Jesus should lead you to freely and joyfully obey all that God has commanded. For the one you truly love, you want to please, not because of fear of punishment for disobeying, but because you don’t want to hurt the one whom you love. Just throwing this out there for you to ponder and reflect on.